The chicken breast is without question America’s favorite form of protein. 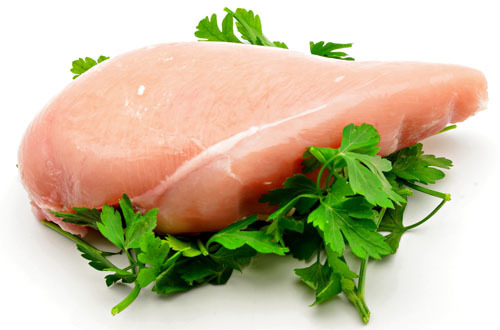 Lauded for its lean, white meat, the chicken breast is enjoyed by the average American about eight times a month. White meat is preferred so highly over dark meat, that much of US’s dark meat is exported to Russia and Asian countries, who prefer it over white meat. However, I will make the argument that there is a better cut of poultry that trumps the chicken breast, hands down. The lowly chicken thigh boosts both flavor and nutrient density. And, because it is not enjoyed nearly as often as the chicken breast, it is often very affordable. Chicken thighs cost about half of the price of chicken breasts. But I know what you are thinking, dark meat is so unhealthy and fattening, right? Wrong. Chicken thighs contain about 0.5 g more of saturated fat and a mere 5 additional calories per 100 grams of meat. What’s more is that chicken thighs have higher levels of vitamins B6 and B12, iron, thiamine, zinc, folate, selenium, and riboflavin. Finally, chicken thighs taste better than chicken breasts! Okay, this one is subjective, but there is no denying that dark meat is more moist and tender. White meat has a tendency to dry out, which can result in a chalky taste, especially when you have it as leftovers. I love chicken thighs. They are easy to prepare, and can be grilled, baked, pan-fried, or slow cooked. I personally purchase both bone-in and the deboned varieties from Costco. The deboned thighs taste great on the grill, in stir fries and fajitas, and quick seared in a cast-iron pan. The bone-in thighs taste amazing braised or slow-cooked. So, I challenge you to come to the dark side and try chicken thighs. Let me know what you think! Where you live has a big impact on the quality and types of food that is available. Living in the midwest gives me access to fresh, organic produce during the growing seasons, and wild fish and game. The disadvantages is that health foods are limited and more expensive than in more urban areas. Because I am living on student loans while in school, I have to prioritize my budget. It is most beneficial to me to spend my money on in-season, local produce and quality proteins. There are pantry staples that I like to keep on hand for favorite recipes and experimenting in the kitchen, such as almond flour, coconut aminos, spices, bone stock, avocado oil, coconut oil/flour/milk, nut butters, lard, tallow, and ghee. Many of these products are difficult for me to find, and when I do find them they are very expensive. I hope with time, finding and affording healthy staples becomes easier! In the meantime, I have found what I believe to be the best prices for nearly every heath food that I could want. Introducing Thrive Market. Thrive Market is Whole Food products at Amazon prices. Actually, at significantly less than Amazon prices. Thrive Market’s prices are up to 50% less than Amazon. Here’s how it works: Click this link to sign up for a free 2 month trial to the Thrive Market. You will receive a coupon for $10 off your first order (yay, even more savings!). Peruse the site for your favorite healthy staples, and get excited over the significantly decreased prices. What is great about Thrive Market is that you can filter the products by various themes such as raw, vegan, paleo, gluten free, and healthy moms. I was so excited when I realized that in addition to healthy staples, there are also vitamins/supplements, health and beauty, baby supplies, and home good. If you decide that Thrive Market is not for you, you can cancel your trial membership at any time during the first 2 months. If you love it as much as I do, you can continue being a member and you will be charged at the end of your trial membership. They send out a reminder email before your trial ends, so you can decide if it is right for you. With my first order, I more than paid for my membership with the savings and free shipping (with every purchase over $49!) Check it out and see if it is right for you! My first order completely stocked my cupboards with all of my favorite staples. I am putting together my next order now which will focus on natural, toxin-free health and beauty products. Comment below with any questions you have about Thrive Market! I think it is a great resource to increase availability of affordable health products. Hi, I’m Tamara. I am passionate about eating real, nutrient dense food and promoting wellness through a healthy lifestyle. My fitness journey began while in high school when my sister introduced me to the concepts of eating clean and weight training. I became very interested in the role that diet can play in our overall health. Since then, my idea of health has expanded. I have read countless books and blogs, all of which have shaped my ideologies about what it means to be healthy. What I have discovered, is that there is no one way to describe health. Likewise, there is no “one size fits all” approach that I can recommend. But if there is one thing I can say with absolute certainty, eating real, nutrient dense, and quality foods is a necessity to a healthy lifestyle. I have spent a lot of my life reading, researching, and trying to discover the best way to live. This blog is going to show you the practices and themes that guide my quest to optimum health, wellness, and happiness. Without further ado, here is my Health Manifesto. As mentioned earlier, if there is one change you can make to your lifestyle, focusing on real foods is the most beneficial. Eating real foods is a simple enough concept, but it requires some guidelines to fully understand. When determining if a product is a “real food”, look at the ingredient list. Ideally, there should be 5 or less ingredients. The ingredients should be whole foods, such as vegetables, fruit, nuts, salt, and spices. The ingredient list should not list artificial preservatives, sweeteners, additives, or other unnecessary ingredients. The best way to incorporate real foods is to enjoy them in their unadulterated natural state. Shop the produce section and select beautiful, seasonal fruits and vegetables. Join a food co-op or CSA and enjoy the added benefits of local products. Purchase free-range and pasteurized eggs from a local farm. Eat abundant amounts of healthy fats such as grassfed butter, coconut oil, avocado oil, extra virgin olive oil, and the fat from quality animals. When eating meat, poultry, and seafood, look for indicators of higher nutrients such as wild-caught, grassfed, and free-range. I plan on further discussing each of the aspects of eating real food in future posts. Our bodies are amazing, complex machines. They are designed to be in motion, and work best when they kept moving. Movement is essential to many of the body’s biological processes. Individuals who spend most of their lives in a state of inactivity are more likely to experience atrophy, congestion, sleep problems, and depression. Incorporate exercise into your lifestyle by whatever means possible. You will become mentally and physically strong. Promoting movement is more than just making it to the gym on a regular basis. It includes the idea that remaining seated or inactive can be damaging to one’s health. In today’s society, we spend much of our time seated, whether at home, work, school, or driving. Moving away from this concept can vastly improve health and wellness. Quality sleep of adequate duration is essential to overall health. This concept is rather obvious, but still so important. Sleep is just as important for you physically as it is mentally and emotionally. You cannot expect to perform at your best if you are not logging in enough zzz’s. Excess stress wreaks havoc on our bodies’ ability to function properly. Ineffective coping results in high cortisol levels. When you are stressed, your sleep quality decreases, energy levels are inadequate, weight loss is impeded, unhealthy cravings occur, and systemic inflammation can result in a poorly functioning immune system. It is easy to see why high stress can contribute to feelings of anxiety and depression. Managing your stress is one of the most important interventions you can take to promote a healthy lifestyle, because stress can negatively affect every other aspect of a health life. Promote relaxation by including practices that make you feel happy and whole, such as taking walks outside, getting a massage, taking a bubble bath, meditating, writing in a journal, and socializing with friends and family. Try to adapt your life and routine to reduce stress in the first place, when at all possible. Remember, reducing stress will result in improvement in every aspect of health. Try your best to avoid and reduce exposure to toxins. Toxins are present in our food, environment, and products we use every day. It is an impossible goal to completely eliminate them from your life, but by minimizing contact, you can avoid the potential hazardous effects. Swap out chemical cleaners for vinegar and baking soda. Avoid cigarette smoke and smog. Purchase local and organic foods when possible. Rinse produce with a vinegar water bath. Consider natural bath and beauty products. Even just being conscientious about what products you use can make a big difference in toxin exposure. Overall, I believe that eating real food, promoting an active lifestyle, getting adequate sleep, decreasing stress, and reducing toxin exposure will lead to an optimally healthy lifestyle. The decision to live a healthy lifestyle is a powerful one. Every choice you make has the potential to fight or feed disease. The purpose of this blog is to share my journey. I hope to include regular posts that delve further into each of my aspects of wellness. I also will post many of my favorite recipes that highlight how delicious eating real and nutrient dense food can be. Thank you for reading, and I welcome your comments, questions, and suggestions below.